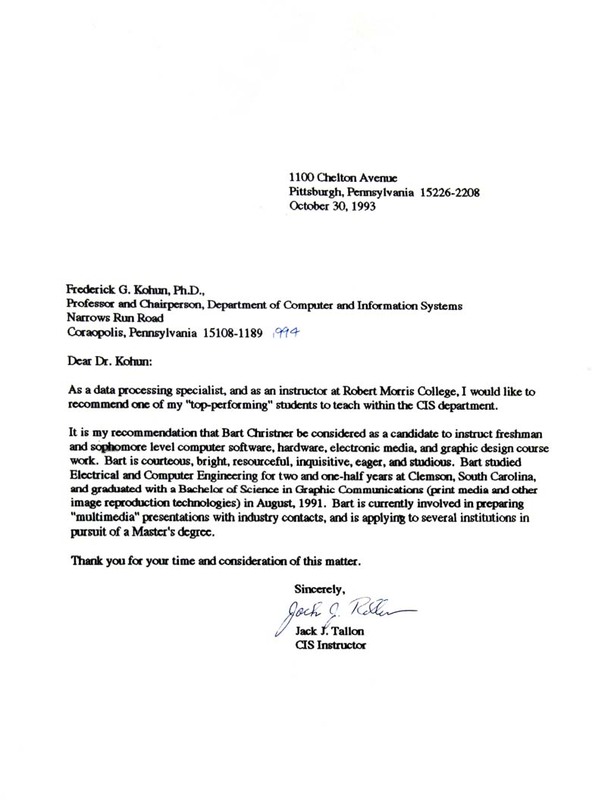 As a data processing specialist, and as an instructor at Robert Morris College, I would like to recommend one of my "top-performing" students to teach within the CIS department. It is my recommendation that Bart Christner be considered as a candidate to instruct freshman and sophomore level computer software, hardware, electronic media, and graphic design course work. Bart is courteous, bright, resourcesful, inquisitive, eager, and studious. Bart studied Electrical and Computer Engineering for two and one-half years at Clemson University, South Carolina and graduated with a Bachelor of Science in Graphic Communications (print media and other image reproduction technologies) in August, 1991. Bart is currently involved in preparing "multimedia" presentations with industry contacts (BFI, Business Forms Incorporated), and is applying to several institiutions in pursuit of a Master's degree.